A warm welcome to your local real estate brokerage serving San Diego County and Riverside County. Founded on the principles of client service and family values, we at Corps d'Elite Real Estate Group pride ourselves in providing you with a personalized, world-class experience for all your real estate needs. 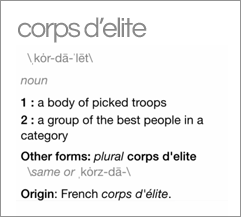 Whether you are buying a home, selling your home, refinancing your mortgage, getting a home loan, looking for property management services or anything in between, Corps d'Elite is here to exceed your expectations at every turn.